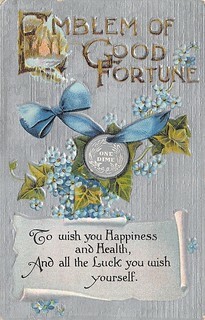 The dime was considered an emblem of good fortune. 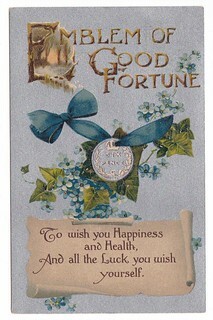 A similar postcard can also be found with a sixpence. The dime is the most common denomination used in love tokens (engraved coins). That might also tie to the sentiment on the card. With the six pence, there is also a wedding rhyme about a six pence in the shoe. These postcards date to early 1900's which is of course a bit later time period but may still be rooted in tradition all the same. As for special qualities, silver is regarded as an antiseptic (killing germs) and maybe this held some significance with the slaves. I do not know what year the antiseptic qualities were discovered but the wealthy have used it in silverware for centuries. There are also sayings about babies being born with a silver spoon in their hands or mouths. I always interpreted that as a sign of affluence but again there is the health aspect to be looked at. In the Victorian period baby rattles were frequently made of silver and coral. Coral was to have had beneficial qualities as well. The three cent silver and the half dime are the lowest possible denominations for silver coins and I would guess that it was difficult for slaves to come by money at all so these smaller denominations may have been better obtainable than larger sizes. I am sure that many escaped slaves also predate the three cent silver denomination, making the half dime the choice. With regard to Abby Cooper's inquiry about half dimes and your response that they were replaced with what we call the nickel, this actually omits a step. The copper-nickel five-cent piece was introduced in 1866 to replace the unpopular five-cent fractional currency notes, which themselves had been a substitute for half dimes. The similar three-cent piece of 1865 served this same purpose in redeeming the even more despised three-cent notes. Thanks for the interesting article. Coins as amulets is an ancient practice, of course. John Chrysostom in the late fourth century refers to people using coins with Alexander the Great’s image as amulets. Fifteen burials were found with pierced coins, interpreted here as charms. The origins of coins modified as charms are first traced to the British Isles and the Middle Ages, and then an explanatory model for their adoption by enslaved (and later freed) African Americans is presented. Turning to the Freedman’s Cemetery burial data, a detailed appraisal of the demographics of charm utilization within a late-19th-century urban African American community is given. One of the more common artifact types encountered archaeologically, directly linked in historical accounts to spiritual beliefs, is the perforated or pierced coin, usually made of silver. The use of this artifact type to protect the wearer by warding off illness and witchcraft is well established in numerous ethnographies and treatises on folk belief (Puckett 1926; Rawick 1972–79), though as detailed below, the assumption that these charms are entirely African derived is erroneous. Coins were recovered from 29 interments, spanning all time periods. 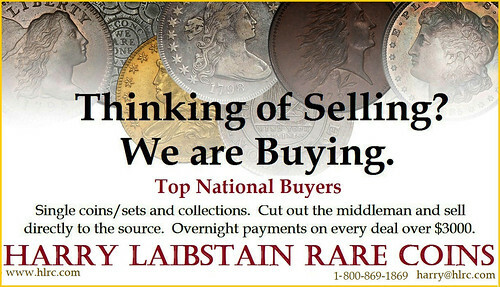 All coins were American currency (in denominations ranging from pennies to quarters) and could be interpreted in various ways, largely dependent upon their placement relative to the body and their physical condition. Some likely were inadvertent inclusions (e.g., left undiscovered within a pants pocket). Others, such as unmodified quarters found in pairs, probably were associated with specific mortuary rituals, as “grave money,” or perhaps used to cover the eyes of the deceased (Puckle 1926:50–52). 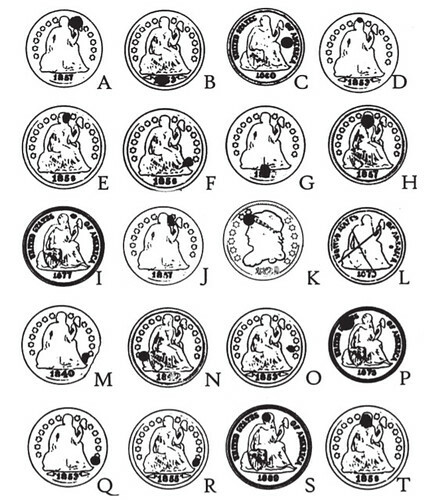 Of particular interest here, however, are the perforated coins associated with 15 burials (Table 1; Figure 1). Recovered in association with the neck or ankle, these perforated coins are strongly reminiscent of charms known from folk belief accounts and indicative of everyday objects charged and imbued with attributes for supernatural control. While the use of charms (i.e., talismans, amulets) was once widespread in both Europe and Africa, unmodified as well as altered (e.g., bent, perforated) coins as charms seem to be primarily European in form and origin. Silver, especially coin silver, once saw common usage in Europe as protection against witchcraft and the supernatural. The modification of a coin by perforating it for suspension may well be an echo of an earlier pagan tradition of charm use, living on into Christian times, with the holing of a silver coin combining several charm elements and belief systems into a single object. First, to alter or modify a coin (i.e., make your mark upon it) is to imbue it with powers (hence the crooked sixpence). Second, in the British Isles, holed objects were considered magically charged. Rocks with holes in them, called Hag Stones, were commonly suspended from strings and used to protect homes, cattle, etc., against witchcraft. The antiquity of this belief is likely great, though known references to their use date at least as early as 1696 (Balfour and Thomas 1904:51; Merrifi eld 1988:162). Third, the silver content of the charm itself is a passive protective element and, at times, may even be used as an offensive weapon. For example, one certain way to kill a witch, or to make her reveal herself if she is disguised as an animal, is to shoot her with a silver coin but specifically with one that is crooked, holed or crossed (Balfour and Thomas 1904:54; Gutch and Peacock 1908: 75–76). The “crossed” silver coin, i.e., a coin with a heraldic cross in its design, is a fourth element of critical importance in coin charms and one with apparent connections to a pre-Christian, Celtic tradition.